Since the structure of oil palm wood varies dramatically, the property gradients of oil palm wood within a trunk are of great interest. In this study, the physical (density, water uptake and swelling in the radial direction) and mechanical properties (bending modulus of elasticity and strength, compressive modulus of elasticity and strength in the direction parallel to the fiber, compressive strength in the direction perpendicular to the fiber and shear strength in the direction parallel to the fiber) of oil palm wood for a whole trunk were examined. The water uptake, compressive strength in the direction perpendicular to the fiber, shear strength in the direction parallel to the fiber, bending modulus of elasticity and strength and compressive modulus of elasticity and strength in the direction parallel to the fiber appeared to be independent of trunk height but tended to be related to the relative distance from surface or density by a single master curve. However, the swelling in the radial direction of the oil palm wood was not correlated with the relative distance from the surface, trunk height or density. Finally, property map of oil palm wood for a cross section at any height was prepared for practical use. This work was supported by the Thailand Research Fund through the Royal Golden Jubilee Advanced Programme (Contract no. RAP60K0017). 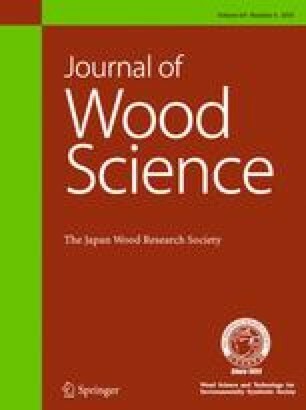 The authors would also like to thank the Research Center of Excellent on Wood Science and Engineering, School of Engineering and Resources, Walailak University, Thailand, for providing facilities for experimental work. The authors declare that they have no conflict of interest.